Península apartments is a great place to live with a pool, nice apartments and great views, but it is just not a place for me. I wouldn’t recommend it to anyone. I would say the building overall is pretty nice. The only issues I have had is the constant weed smell and the elevators smelling awful and the package room is always cluttered. The staff/leasing office are very nice over the phone but in person,( Breanna) they always act like everytime you ask them a question or even bother them they act like its a huge inconvenience for them when it's their job. Alex was this way at first but then I called her out of it and she apologized and has been amazing since. It's definitely not luxury. Its a great place to live if your a Umass boston student though. Harbor point is less expensive though. it is very nice, but too expensive. The prices at harbor point are way more reasonable. Everything else is nice though but also wish the gym was cleaner. Move in is a bit difficult as require 2 checks and for me ask international student it is hard to get them. Staff is friendly and service like internet is eazy to get as they have dedecated staff in building. Although I love the amenities, view, and space in my apartment, neighbors are extremely loud and uncaring, and the wooden cabinets and refrigerator have a lingering smell that I just can not get rid of. Many aspects of living here is good, but get too loud at night (regular days and weekends). Also at times grill area, and area around the coffee machine are not cleaned well. For example at times there are small insects around the coffee area at the common room. Construction can get noisy and there isn’t nearly enough visitors parking. But overall, the accommodations are good and it’s a nice place in general! But yeah, figure out visitors parking please. Good apartments. However, low-quality furniture and fittings. Taps and door are of extremely low quality. A bit of higher quality furniture and fitting would make it 5-star apartments. 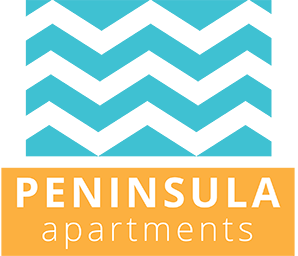 Peninsula II is still better than the Peninsula I.
I like the inner design of 375 building, especially the kitchen and floor. Every unit has washer and dryer, which make convenient to my daily life.